Are using your iPhone with Straight Talk Wireless? Does the error “Could not activate cellular data network. 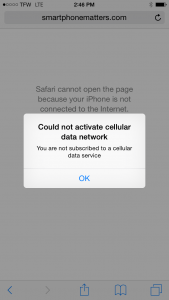 You are not subscribed to a cellular data service” pop up when you try to use cellular data? 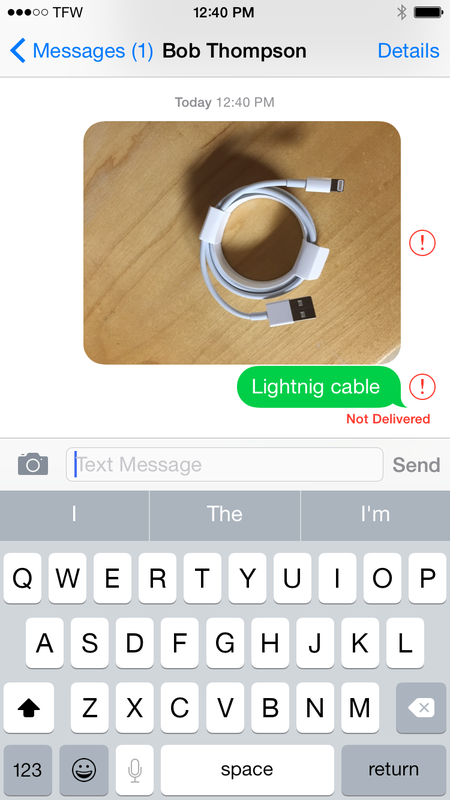 Do you see “Not Delivered“ in red when sending MMS picture messages? If so, keep reading because this article will help you. I divided this article into six parts. You only need to read the parts that are relevant for you. Follow part 1 and part 2 above. You only need to follow part 3, 4, or 5 for your specific APN which you looked up in part 2. Hopefully you were able to follow the steps above and get your phone working. If that is the case, great, please take a moment to leave a reply below and share if this worked for you. On the other hand, if it didn’t work and you would like some help, leave a reply below with a description of what went wrong and I will try to help. When I try to do the APN it says I already have one configured how to I take it off ? item 1 under Setting up your APN in the article. Oh My Goodness!!!! Thank you, thank you, thank you! I’ve been trying to get my data to work for months but wasn’t too bothered by because I had wifi at home and so I didn’t particularly need it. But now I’ve just moved to a new city and am completely lost without my GPS. I was getting worried about finding my way around. Thanks to you now I don’t have to be. Thank You!!!! Hi again Bob…I’m sorry I’m not sure if my first message went through. So I’m trying this again. I have an iPhone 6s with a T-Mobile SIM card. The issue I’m having is not being able to send and receive iMessages or picture messaging. Standard text messaging does work. My browser also has perfect access to the Internet even when wifi is off. But for some odd reason my camera icon does not even register me touching it when I try to send a picture when messaging a friend. It also doesn’t work when I simply try going into my photos and sending a picture that way. I have tried all of your suggestions that I have found on the website including setting my apn in the cellular data network and then resetting my network settings and when that didn’t work, tried resetting eveverything and that didn’t work either…and I have tried going back and entering all of that data back into the cellular data network after resetting my phone and still nothing…and j have tried this twice. So I’m at a loss as to what I should do or try next. Your suggestions and help is much needed and appreciated. Thanks Bob! Hi Bob…I’m sorry I forgot to mention that I have an iPhone 6s and I had to use a t-mobile compatible SIM card for my straight talk service. I’m not sure if this added information helps. Your help is much appreciated! Sorry your original comments were accidentally marked as spam. Sounds like you may have the MMS option turned off. Tap Settings > Messages Make sure MMS Messaging is on. The button should be green. Afterwards check if you can attach a picture to a message. You many need to double tap the Home button, and slide up on Messages to close it before trying to add picture. Hi there…I have tried all of your suggestions but for some reason my picture texting still doesn’t work…I may add that everything else works including access to web browser without wifi. Picture text is the only issue Im having…for some reason I can send and receive text messages but not i-messages. When I try to tap on the camera icon to send a picture to a friend, it does nothing…it doesn’t even register me touching it…it also doesn’t work when I go into my photos first and try to send it that way. So I am at a loss as to what I should do next. I have tried setting my apn in the cellular data network exactly the way you suggested on this website. If you have any further suggestions or advice on what I should do…it would be greatly appreciated. Thank you! Hi Bob, thanks for helping us out! My problem is also error message “Could not activate cellular data network. 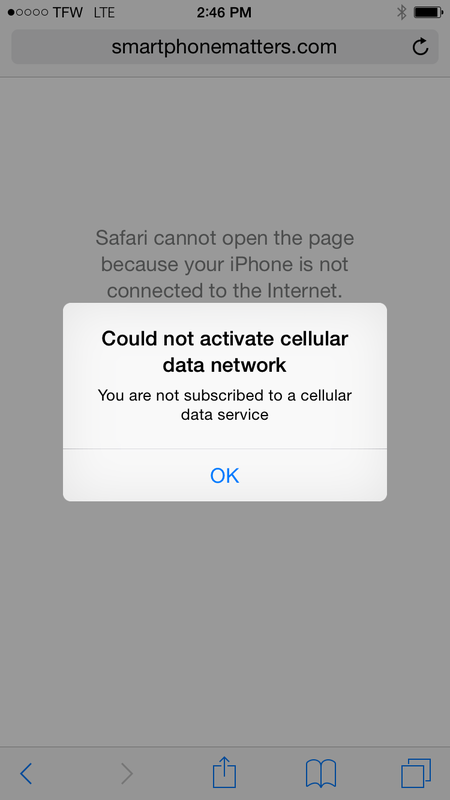 You are not subscribed to a cellular data service” on my iPhone 5 which I purchased last week from Straight Talk. I ported my number from Verizon and I am able to make, receive calls and send texts. I also reseted the Network Settings. Thanks, let me know if you can think of anything else. Try installing the profile on your iPhone, that’s probably the issue. I just finished working through your list. 6. Can I request that they switch me to the Straight Talk AT&T Network? Or how does that work? We live so remote, I am sure AT&T is as good/bad as Verizon. 7. I guess switching to another provider is the last resort. I really liked Straight Talk so far. Also not sure how many options there are considering we are in Hawaii. The customer support # in step 5 should be better than the normal number.Give it a try. I assumed your phone used the Straight Talk Verizon network because you said you ported from Verizon, but I just read you bought this phone from ST.
Did you install a SIM card? Did it come attached to a plastic card? If so what color was it? What does your phone display in the top left of the status bar? Verizon? TFW? when WiFi is off, do you see a 3G / LTE or something else? Bob, yes I ordered this iPhone new from Straight Talk and installed the SIM card that ST sent me. The SIM card is of white color. Yes, it did come attached to a plastic card. The top left of the phone shows TFW network. When WiFi is off, it shows 3G and after a short time 1x. Take a look at this video, did the SIM card look like the Verizon one or the AT&T one? A 1x or 3G connection isn’t very good. Ideally you’d want to see an LTE connection. The SIM card looks more like the Verizon one in that video, being white and having the red “Important” arrow pointing to the SIM card. I have 3G and 1x where we live, in town I do get LTE – but still no internet. I did that. Unfortunately where we live there is only 0 or 1 bar and he said you need at least 2-3 bars to test. So I will drive somewhere this afternoon and hope this fixed it. Give it a try, but that is the same profile I recommended installing so you may have already tried it. Bob, you are right. I somehow thought the URL was different. It seems (with 3G or 1x) that sometimes it works now and I can use cellular data. I havent made it to an area with better reception so the final test is still pending. Maybe it worked (I hope!) because I restarted the phone after installing the profile and turning off WiFi. Not sure. I do think I restarted the phone when I followed your instructions. Did you use Verizon service at the same location that you are currently using Straight Talk Verizon? Did you get LTE or did it work better with Verizon? I think the article states that this doesn’t work for the ST Verizon network. Try installing the Verizon profile. You can find the link here. I was on live chat with ST support tonight for at least an hour. I’m trying to help my mom. She bought an iPhone 4s on ebay, purchased an AT&T Compatible sim for it and activated it on her ST plan. No issues with calling or sending text messages. However, she cannot access the internet or send MMS. I followed the guides here to no avail. When I had ST on live chat they instructed me to remove any profiles installed, reset network settings, connect to wifi, go to apnupdatevzw.straighttalk.com and install that profile – then reboot. Tried this process several times. When the phone first boots up, the status bar says TFW only for a moment – then it says 1x and then it says 3G. The guy at straight talk was out of ideas. That’s not really the support I was looking for. It’s my mom’s first iPhone. I was excited for her. iapnupdatevzw.straighttalk.com is for Straight Talk’s Verizon network, not Straight Talk’s AT&T network. Remove the profile. Connect to WiFi. Go to settings General about. Install the carrier update if prompted. Your carrier should be TFW 24.2. If it’s not install the APN profile for the ST AT&T network. the link is in the article. My APN didnt work I need help. did you follow the steps in the article? Can you share some details about what you have and what did not work? Try following the steps in the article. Put my phone number and phone type in, (iphone 5c), clicked search and nothing came up. No sorry. It never loaded the first time. I get “The Phone Number or the last 15 digits of the SIM card you entered does not belong to our GSM Bring Your Own Phone Program. Please note there is no need to update your APN Data settings if you have a Sprint or CDMA phone.” this is my third month with straight talk. Are you using Straight Talk’s Verizon or Sprint network? This won’t work for that. Which network are you using and what problem are you having? I have done everything you’re saying and still having issues. I have an iPhone 5s and it won’t populate me with a phone number on the website. I don’t know what apn I use. Can you please help? By “it won’t populate me with a phone number on the website” do you mean it doesn’t show you an APN for your phone number? Are you using the Verizon network? Did you buy your iPhone from Straight Talk? I used my sprint phone and came over to straight talk and I am having issues with normal text messages. Do you have a fix for that issue? I have an iPhone 5 from the Sprint Network. Messages seem to go out but the recipient never gets them nor do I receive other’s messages. You do mean text messages and not MMS or Group Messages? Not for text messages. You could try a network reset and see if that helps. You may need to call support. Ah okay I figured it was worth a shot. And yes I did mean text messages. But it turns out I can make phone calls but not receive them and I can’t do anything text message wise but I can access the internet it’s really odd. The phone number or last 15 digits of the SIM card you entered does not belong to or GSM Bring Your Own Phone Program. Please note there is no need to update your APN Data settings if you have a Sprint or CDMA phone. I bought two refurbished Samsung galaxy s4 phones from straight talk. One works great the other has no data service. No Internet and doesn’t send multimedia texts. Any idea’s.? The APN lookup is for phones using the ST AT&T /TMobile network. Do you know which network your S4’s are using? Verizon maybe? Have you tried swapping thr SIMs between phones to see what happens? Take a look at the instructions I wrote again. I’m using straight talk BYOP and I can’t get Internet when I’m not connected to WiFi. I’ve followed the first two steps on setting up my iPhone 6+ with negative results. I’m running version 9.2.1 (13D15). Thanks! Why only the first two steps? Hi! I have an iphone 5 under sprint’s network and I’m using CDMA (no SIM). When first using the phone, it worked perfectly for months, however about two months ago both the data and mms messaging stopped working for me. The only time I’m able to get pictures is if I’m in a bad area and my service has gone from 3G to 1X. Please help? Try this Resetting Network Settings on Your iPhone. Do you know for a fact this phone is on the Sprint network? Yes sir! It says Sprint by my service bars and in my settings. and I’ve tried the resetting of the network settings, but that still hasn’t worked. ok then, I don’t get too many people here using the ST Sprint network. Try texting the word APN to 611611 and see if it sends you back a link to click on. With texting APN to 611611 it says “Service Not Available” and under Cellular, Cellular Data is on and so is LTE. I cannot get an apn for my phone. It’s been saying it cannot activate cellular data network for a week now. It’s been working fine for a year. Verizon iPhone 5 – switched to straight talk. In the straight talk site it says my phone isn’t a bring your own phone – ???? When I put in my phone number but I can get phone calls and send sms texts. Please help!!!!! As I mentioned in the article, this isn’t for phone’s using Straight Talk’s Verizon network. Start by reading and following the instructions on the page you commented on. I went straight to the page (like 6 or 7) were the apn’s are & clicked on the one that was my network, which was Verizon for me. And I downloaded it & immediately my data started working. Hope this helps if u havn’t fixed it yet or helps someone else. Phone cellular data is still not working. That’s not much information to help you. What phone? Which network? did you just sign up? Or did it stop working? Try this Looking up Your Straight Talk Wireless APN Settings. What does it say your APN is? I have an iPhone 6S and have iOS 9.2. I have called in to Straight Talk several times the last three days as I have been getting the message of “no cellular data service” when I try to access it away from WiFi. The phone is an unlocked phone direct from Apple that can access both CDMA and GSM. The networks around me for Straight Talk use CDMA so I have a SIM card from Straight Talk. Can you give some advice on how to correct this issue with connecting to data while away from WiFi. To note, I previously had an iPhone 5 that I bought from Straight Talk and had absolutely no issues with it – no problems with texting, calling, or data. Only issue was that the phone only had 16 GB and my memory kept getting full. New iPhone 6S has 64 GB. Thanks for any assistance! are you using the Straight Talk Verizon network? Do you see the Cellular Data Network option in Settings > Cellular? From what I have previously been told, yes, I believe in my area we use the Verizon towers for Straight Talk. In Settings, the Cellular Data option is on (as is the LTE option). Through the three phone calls thus far with ST, we have turned off Bluetooth and WiFi as they “make changes” on their end. Each time, I have to turn off and turn on my phone again. Each time, the same error message comes up when I go to Safari to access a web page (ditto on trying to get on FB – never loads). The last option they told me yesterday was that I was going to have to do a factory reset, thereby erasing everything on the phone and starting over. I was not in the position to do that yesterday, as I had pics & video to upload to a computer. Now that has been done but I hesitate to do that unless it actually stands a chance of working — major hassle getting everything reloaded onto the phone. Any help would be appreciated. We have done a network reset twice now to no avail. See Randomly Losing Straight Talk Verizon Network Data Connection on My iPhone. 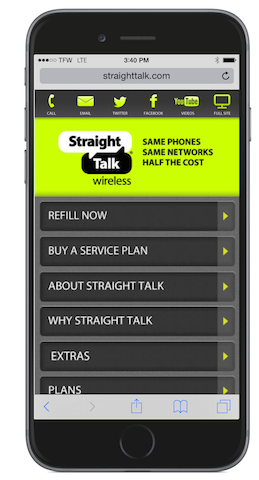 Do you know which Straight Talk network you are using? Hi 🙂 I have tried all of the steps for the tfdata APN, my cellular data is working, but my group and picture messaging are not. When I look up on Straight Talk it says my APN is Reseller. I am using the AT&T SIM for Straight Talk and I have an iPhone 6 Plus…everything was working fine the first month of service, and after I bought a new month of service it hasn’t worked since. I am trying to set up an iphone 6 for my dad. It was originally on tmobile. He said he had an att compatible SIM card. I set everything up per your directions. Straight talk website said wap.tracfone. Phone calls work, cellular data works, SMS works, but mms won’t work. What should I try? Thanks. 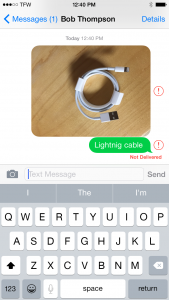 Did you test both sending & receiving MMS? did either sending or receiving work? Bob, I tried sending and receiving mms messages on my dads phone and neither one will work. If your dad recently signed up for Straight Talk and his APN is wap.tracfone, he most likely is using the Straight Talk T-Mobile network. That said he should still be able to get MMS working. I’d recommend removing any profiles installed on his phone, doing a reset network settings, and then reentering the APN settings. Thanks for the info. I will try that this weekend when I see him. Question though, there are three APN settings for his phone… One is cellular, one is mms and I dont remember off the top of my head what the other one is. Which section do I enter the APN information? Thank you so much for the help. I got everything working correctly. Thanks – have an iphone 4s with 9.1, tfdata. Cellular just stoped working a few days ago? This bailed me out – great article. I use straight talk but do not have an APN… But it is exactly how u explained…will make calls and send text and use wifi but WILL not use my internet without wifi and will not let me send pictures or iMessages. I have reset my phone a million times, network reset, erased everything resets and even just restored with no backup and even contacted apple and straight talk and they want me to send in the phone but I can not go without a phone waiting to get mine back! Help! I’d recommend calling straight talk. Ask them if they can push you APN settings and your MPN account settings. no APN. Just says RESELLAR. No cellular network data tab to where I can enter any settings. It seems the Straight Talk web site is currently broken. It’s returning the wrong values for your APN. Follow the guide as if your APN is tfdata. If you can’t see Cellular Data Network, my bet is you are using the Straight Talk ATT SIM. Let me know how it goes. I have straight talk. And I believe T-Mobile sim. I also don’t have a “cellular network” tab under cellular. I can’t set anything manually or nothing. You’d really need to share more details than “I did all of this” for me to help you. For instance, what is your apn? I’m on iphone 4S, iOS 8.4, cellular and data all work perfectly except for the picture messages to non-iphones. No edit button? anyway, I worry that the steps on this site won’t help me? Or can they? I am using a straight talk verizon phone with the iOS 8 update. I cannot get the internet or picture messaging with without being on wifi. If you are using Straight Talk’s verizon network you can’t set the APN yourself. Try Resetting All Your iPhone’s Settings and see if that helps. If not, call Straight Talk for help. They may be able to fix the problem for your end. Bob, I am using a Verizon iPhone 5 on Straight Talk (ST) with the IOS 8.3 update. I keep having to call ST because I get the message that I’m not subscribed to the Mobile Data Network. They are able to update the APN (they referred to them as network MPN settings) settings for me and the phone works for mobile data and iPhone messaging. for a limited time. I get this message several times per week. I do not want to have to keep calling ST to maintain my mobile data connection constantly. I even tried installing a ST APN Profile myself with no success. Is there anything I can do to to not have to continually call ST to get the settings updated and take care of this myself? I don’t know. You are not the only person having this problem but I have not heard of anyone getting a resolution. If you are on Straight Talk’s Verizon network, installing a profile will not help. Remove it. Can you try texting APN to 611611 next time it happens and tell me the results. I don’t have a verizon iPhone to try that on. Bob, as per your instructions, I texted APN to 611611 and got the message ‘service not available, please try again later’. An ST rep told me that they were updating my account MPN settings, not APN on the iPhone 5. I deleted the ST APN profile a while ago after I realized that it did nothing. When I call ST, I’ve only been able to talk with non USA reps and supervisors. Although they ‘fix’ the mobile data connection at the time, I haven’t been able to talk to anyone in the USA who has a permanent fix. Do you have any other ideas or suggestions? I’m very frustrated and reconsidering my choice of ST. I don’t know if it’s just me, but I dont quite see any instructions for how to set up wireless apn using ios8 here. I only see two screenshots, but no further instructions. I was on the phone with straighttalk earlier today because I had issues sending pics to people who didn’t have iMessage. The lady didn’t know what she was doing and now I can’t even send pics at all. My phone keeps going in an out of iMessage. I’ve tried updating my APN settings, and that doesn’t work either. Any way you can help? Thank you! Are you using the straight talk T-Mobile compatible SIM card? Do you see home in your status bar? When you turn off wifi, do you see LTE, 4G, 3G, or E? You need to scroll to the Setting Your Apn section of the article. Right below “I divided this article into six parts. You only need to read the parts that are relevant for you”. There is a list of six articles. These are hyperlinks, you need to click on them to read each individual article. (Iphone6)I’m running iOS 8.4 and got straight talk this iphone was bought at full price and I’m using the SIM card that is “tmobile” compatible – results – I can call but the internet won’t work in fact it only begins to load but never gets anywhere so I can’t do anything I can’t even open clash of clans . I’ve reset iphone and network settings I’ve also imputed the apns what can I do? You can email me screenshots of your settings. Send them to bob at the name of this web site. Also, when you turn off Wi-Fi what do you see in your status bar? Do you see HOME? do you see LTE, 4G, 3G, or E? Have you used the TMobile network before? Are you confident that that network has coverage in your area? Did you deliberately choose the TMobile SIM over the ATT SIM? Did you follow the instructions in the article? Did you look up your apn? What is it? I have a Verizon iPhone 5 that has had cellular data issues 7 times now. Each time I call, they magically reset something and it works for a few days. I don’t even use that much (total 1.7 Gbs this past month) I’m getting very sick of having to keep contacting them about the same issue. I have updated to 8.4, reset all settings, did a complete restore… I’m not sure what else to do! I find it odd though that my husband has the same exact phone and service, but hasn’t had any issues at all. Any ideas? That sounds horrible. I don’t know what is causing it. Are you using a Straight Talk phone or a BYOP phone? Are you using the ST verizon SIM? same for your husband. you can email it to me at bob at (the name of this website). I use verizon cdma and have had either no service or very sketchy service since 4 July. Help? I’m not sure if this is even important but I forgot to mention it in my first message. When I tried to update to iOS 8.4 on her phone, it said “unable to install update. An error occurred installing iOS 8.4”. I’m not sure if that’s even relevant but it was worth mentioning. Thanks again!! I have tried everything and have read all of your articles. Nothing seems to work?! Please help!! I know if anyone can help, it’s you! Thanks so much and I hope to hear from you soon! I’ve tried these settings as well as the ones straight talk gave me. I have a sprint unlocked iPhone 5c that I am using with a T-Mobile sim. I am able to use my phone the only issue I have is that my data won’t work. I can text and call without wifi but without a wifi connection I can’t iMessage. What settings did you try? I am on ios 8.3 and have the verizon cdma-compatible iPhone 5. I tried activating LTE. Now I’m getting the same error, cannot activate cellular data. Why do I need to talk with someone directly and there is no instructions online for this? Setting up iPhones for Straight Talk’s ATT and TMobile networks is different than for their Verizon network. You would have to ask Straight Talk directly why they don’t have instructions for this. As for smartphonematters, I haven’t yet written an article for setting up Verizon / CDMA iPhones on Straight Talk’s network yet. For Verizon phones, the setup is supposed to be automatic. If it doesn’t set up, there is little you the end user can do except call Straight Talk. You can try is to Reset Your Network settings and see if that helps. If not you can try Resetting All Settings.